So, you’re considering building a deck to enhance your backyard and to create that “outdoor living room.” Great idea. It will extend your living area and add value to your house. So you talk to some contractors, learn what’s involved and get two proposals. One contractor will build you a deck for $8,500, but the other contractor wants $26,384 for a similar deck. What??? You read that again, and suddenly you know less than when you began! But really, you ask, What does a deck cost? A good question, but not a simple question. Before I answer, let me ask you a question: What does dinner at a restaurant cost? You can get a burger, fries, and a coke at McDonald’s for $5.49. And you could also spend over $150.00 for a truly memorable dinner at that classy, gourmet restaurant in the city. That’s a monster price range – over 2,700%. Happily, decks are not as complex as dinner — or at least deck prices do not range as wildly as dinner prices. Let’s take a careful look. Five major factors affect the price of a deck. ♦ Size. In general, if you double the size of a deck, you double its price. But sometimes enlarging it by just a few inches increases its cost disproportionately. Those extra inches could require more footings. (What’s a “footing”, you ask. Don’t worry, you don’t need to know. It’s just part of the structure that supports a deck.) Worse, those extra inches could require larger joists or an extra girder and more columns. (Enough! No more talk about joists and girders. This is a family blog. Keep the language simple. And cover up that deck!) Sorry. ♦ Material. While the frame of every deck is (should be) made of Pressure Treated wood (called “PT” by those smug contractors), there are many choices for flooring, trim, stairs, rails, etc. Pressure Treated pine is the least expensive, but it shrinks, splinters, and misbehaves over time. Cedar and mahogany look and behave better, but they cost more and still require yearly treatment. Synthetic materials – composites and PVC – cost even more, but need very little care. Consider rails for a moment. Mahogany rails cost over twice as much as PT rails, and high-end vinyl rails cost four times as much. So instead of paying $1,500 for rails, you’re suddenly paying $6,000. Ouch! The labor here is roughly the same. So, that dramatic difference is all……material. 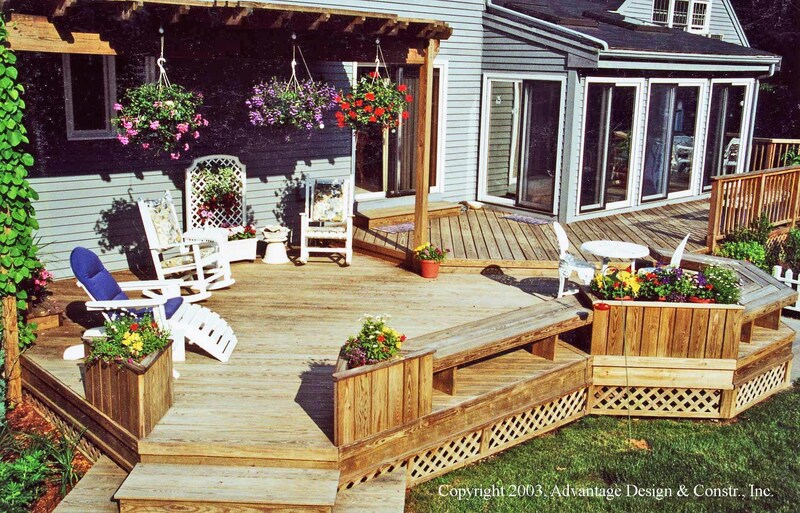 ♦ Design Amenities can add to a deck’s cost. Multiple floor levels, decorative flooring patterns, benches, lattice, pergolas all cost more. (Hey! You promised to keep the language simple. What’s a pergola anyway — isn’t it a big purple flower? You know, “To celebrate the occasion, he put a pergola in her hair.”) Amenities can dress up a deck (like well-placed, colorful planters) and enhance its usefulness (a separate area for the grill) or even make it safer (a gate at the top of those long stairs). But they increase the cost, as do appetizers and desert for dinner. ♦ Site Conditions impact cost as well. How high is the deck off the ground? Must the carpenters work off ladders? Will it require long stairs? Is there a septic system in the way? Can a backhoe (think “big digging machine”) get into the backyard or must the carpenters dig those four-foot deep holes by hand? Where is the gas line? And just how rocky is your backyard? ♦ The Company you choose. Oh, you mean some companies just charge more. No, I mean some deck building companies actually do more. 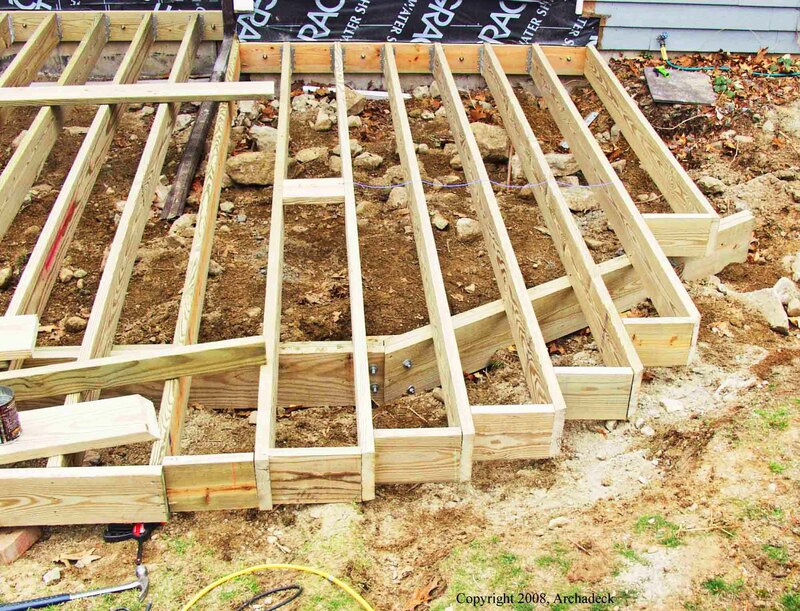 Building a deck requires a Building Permit from your town. Do you want to draw the detailed structural plans required for the permit? Do you want to discuss Building Code issues with the Town Inspector when he arrives to examine your deck frame? Or would you rather hire a company that acquires the building permit and deals directly with the Inspector? A custom deck builder that has licensed, professional crews, and an experienced construction manager. A company that has written construction standards, that’s fully insured and provides a written warranty. A company that will respect your property and will be around in the future to back up that warranty — and has a reputation in your community for quality work. Be careful here — you could save many thousands of dollars by hiring “Chuck with a Truck” who just bought some tools and has read all about decks. After all, he built your neighbor’s deck last month, and it has not collapsed…..yet. What will your new deck cost? The internet has many articles that tell you decks should cost “$10 to $16 per square foot” or “$13 a square foot” (yeah, in 1997), or “$35 per square foot.” Just search on “deck cost” and you can be misled in many different directions. I suggest to you that a “per square foot” price is the least appropriate measure. That’s like saying the cost of a dinner is determined by its calories. There is much more to consider. Remodeling Magazine offers perhaps the most professional answer. Each year (for over 20 years) it researches and publishes a “Cost vs. Value” report that lists the cost of numerous home remodeling projects in different areas of the country. It includes the cost of a Wood Deck and a Composite Deck. Click on the project name to view a brief description that identifies materials, some design elements and the amenities. In their 2018 report, Remodeling estimates the cost of a “midrange” deck in the Boston area could vary from $15,400 to over $20,000. The best synthetic decking and rails will drive that price well over $35,000. And an upscale deck? With different levels, under-deck roofing, a pergola, perhaps an outdoor kitchen,…? We’ve designed and built upscale, custom decks valued over $60,000. It all depends on what you truly want. How should you choose a company to build your deck? Skip over companies who will paint your house, re-shingle your roof, and also build you a deck. Focus instead on companies that specialize in decks. Check them out in the Better Business Bureau. Better yet, read full evaluations written by consumers in Angie’s List. One final thought. If you buy a deck based on price alone, you’ll get what you pay for. You choose: Your deck can be an outdoor living room that expands your life, enhances the beauty of your home and increases its value. Or it can rob your weekends by requiring frequent treatment and tricky repairs; it can fade into a backyard eyesore; and it can drag down the value of your home. We at Archadeck of Suburban Boston offer professional design and build services for clients west and north of Boston. Over the past 26 years we have designed and built over 950 projects, including more than 200 low maintenance decks. We have enhanced the depth of our expertise by limiting our work to decks, porches, patios, and sunrooms. To view some of these projects, visit our website. To learn how we treat our clients, check us on Angie’s List. For a free design consultation and a relaxed and rewarding experience, contact us via e-mail, subboston@archadeck.net or by phone, 781-273-3500. NextSYNTHETIC DECKS: No Maintenance, Low Maintenance, Mo’ Maintenance – What care will your synthetic deck need? This is a great blog. A ton of info. Anyone looking to have a deck built should review this material and then be able to make a more informed decision that will greatly benefit them for many years. I do have a question that I am not sure I saw answered…regarding deck safety, do professional deck builders such as you or others deck builders across the country offer the service of doing inspections on existing decks? Thanks for your comments. Yes, we at Archadeck of Suburban Boston offer a thorough Deck Safety Inspection, and most of the other 62 Archadeck offices offer them in their states as well. I just posted a review of what maintenance different synthetic decks require. What deck or porch topics would you like to read about? Thanks for your kind words. I need to improve my “search engine optimization” — I’m fairly new to blogging.